Originally Christopher Stahlmann's Cave Brewery, this was the home of the Jacob Schmidt Brewing Company until 1990 when it closed in a leveraged buyout. It reopened in 1991 under new ownership as the Minnesota Brewing Company. The brewery experienced a brief period of success, adding the Gopher State Ethanol plant in 2000 to produce ethanol for the fuel industry. Odor and noise related to the conversion of thousands of tons of corn into ethanol was causing a backlash in the West End neighborhood around the St. Paul plant. 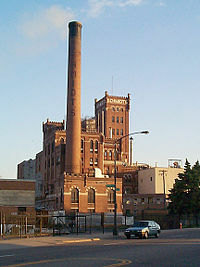 In 2002, the brewery operations were closed, and the Grain Belt recipe and labels were sold to the Schell Brewery in New Ulm. The ethanol plant remained open for another 2 years before shutting down in 2004. However, despite changes in ownership and cease in operation, the Schmidt Brewery, remembered well by it's red blinking sign and famous slogan The Brew that Grew with the Great Northwest, remains an icon within St. Paul's West End neighborhood. Following the death of the original owner in 1883 and the ensuing deaths of his three sons one after another, the Cave Brewery went bankrupt in 1897. In 1900, Jacob Schmidt, a Bavarian born brewer, purchased the complex and began an expansion project that included forced-air drying and modern mechanical refrigeration that replaced the need for Stahlmann’s lagering caves. Jacob Schmidt died in 1910 and left his business partners, Adolf and Otto Bremer, who made the brewery into one of the leading regional beer producers in the country. The brewery's success helped make the Bremers one of Minnesota's wealthiest families - and a target for kidnappers. In 1934, the Barker-Karpis Gang—under orders from Ma Barker and Creepy Karpis—kidnapped Adolf's son Edward Bremer. The thugs had already kidnapped and released William Hamm Jr., president of the city's Hamm Brewing Co., for a $100,000 ransom. When President Franklin Roosevelt decried the crime, however, the gang released the beer magnate. During Prohibition, Schmidt beer was delivered to the underworld's Green Lantern Saloon via tunnel to a brewery employee's house on Erie Street. The vigorous activity of the brewing industry at the turn of the century occurred in spite of a growing temperance movement in the state. Newspaper articles celebrating St. Paul’s emergence from the economic depression listed every leading industry but the one that had made the most investment. During the Schmidt era, workers were originally organized by the Brewery Workers Union. The predominantly German Brewery Workers were one of two industrial unions in the early AFL (the United Mine Workers was the other). Proudly socialist, they put the slogan, "Workers of the World Unite" at the top of their union letterhead. Adolf Bremer died in 1939, and Otto carried on as president until his own death in 1951, leading to the first of many economically challenging periods for the ill-fated brewery. By 1958, the company finally succumbed to its losses and sold the operation to Pfeiffer Brewing Company of Detroit. The St. Paul branch of the Pfeiffer Brewing Company experienced nearly two decades of success, employing new marketing and advertising campaigns, including the introduction of the scenic can series created by famed Minnesotan artist Leslie Kouba. Kouba's designs were used in ad campaigns for nearly 20 years. By 1972, the brewery was sold to the G. Heileman Brewing Company of La Crosse, Wisconsin. Under new management, the brewery became the fourth-largest brewery in the country by 1981. However, in 1987, the company was purchased by Australian corporate raider Alan Bond, “which caused Hieleman to become part of the largest financial collapse in Australian history.” The brewery was closed in 1990, despite the efforts of St. Paul city leaders to preserve the business and the hundreds of jobs that would be lost. Idle for more than a year, the Minnesota Brewing Company finally secured approval to purchase the brewery in 1991. With its new Landmark and Pig’s Eye Pilsner brands, and the revitalization of the Grain Belt brand, the company, which was re-established as a microbrewery, experienced a brief but fruitful period of success. However, hindered by renovations to old and inadequate equipment and too small to compete with major national brands, the company experienced substantial annual losses that forced its closure in 2002, ending 147 years of brewing at the site. In 2007, after three years of failing to secure a committed buyer, father-son developers Jeff and Craig Cohen proposed a $200 million project that would include turning the brewery's 15 acres into an urban village with apartments and condos, office space, shops, and a cellar restaurant while keeping the site's historical structures intact. Under an agreement announced in 2008, the Schmidt Brewery bottling house was slated for purchase by Dominium Development and Acquisition (developers of the Carleton Lofts in Saint Paul) from the Cohens. Dominion hoped to convert the old bottling house into 100 live-work artist spaces. However, the father-son team failed to secure financing and their $200M re-development plan never moved forward. As of Fall 2010, the brewery complex was being advertised for sale by commercial real estate company, NAI Welsh, for $7.8M. The 'Schmidt' brewery sign could be seen for a long distance in Saint Paul. It was especially bright and visible from Linwood Park on St. Clair Avenue. The residents missed the sign when Landmark Brewery took over and put up their own name. Unfortunately, the Schmidt sign was destroyed. The Minnesota History Center library houses an extensive collection of The Great Northwest, an internal newsletter circulated between the various branches of the Pfeiffer Brewing Company. Vol. 1, No. 1, issued in April 1959, states that the newsletter served as "the family album of the Jacob Schmidt Brewing Company...to develop a bond friendship between home office people, distributors, and the retailers of seven states." In 1959, the Jacob Schmidt Brewing Company won an award for an "outstanding example of progressive packaging" - the 6-pack carrying case. The Schmidt Brewery is NOT currently listed on the National Register of Historic Places. The brewery is listed on the Preservation Alliance of Minnesota's 2009 and 2005 lists of the state's 10 Most Endangered Historic Places. In 2005, historian Paul Larson, by request from the West Seventh/Fort Road Federation, conducted the only known designation study for the Schmidt Brewery. The designation study can be viewed at the Minnesota History Center library in St. Paul.